Join us on April 29th 2017 for our Annual Career Fair. Within Chick-fil-A we seek to create opportunities that will enrich our team members for years to come. If you enjoy the fast paced nature of a restaurant with a fun and flexible environment than Chick-fil-A may be a good fit for you. At our Career Fair will be interviewing candidates to various positions that are available within the restaurant. For more details please visit the restaurant or apply through our site. Visit us on April 29th from 9am-2pm for more information about our Career Fair and available positions. Today is our Career Fair day from now until 1:30pm. We will be on site at our Chick-fil-A Location in the Silver Hiring Trailer. Come stop by anytime in between that time. We are across the street from Bass Pro at the corner of Bass Pro Drive. See you soon!!! This week we were able to capture another 360 Degree video of the restaurant. Our signage is up on the restaurant and the interior design is coming together nicely. Be sure to continue following our blog for more updates. Don't forget our Career Fair Day on August 17th from 9:30am-1:30pm. Click Here to Apply. As we continue the hiring process we were able to take a break to capture another exclusive footage of the restaurant progression. Be sure to learn more about our restaurant through our website or Facebook. Check back next week for another edition of our fly over!!! Join our Team. Application acceptance begins today. Together we are MOREthan a team, a community, a restaurant, a business. We ask that all applicant have a heart to serve other. We seek applicants that are adaptable, attentive, aware, accountable, and seek accomplishments. Get your 360 Degree VR Viewer Ready!! We have officially released our 360 degree video of the restaurant walk through. Check out the latest video footage. Be sure to check back daily on our site to see updates. We were able to capture another updated video into the progress of the restaurant this week. Be sure to check out our Facebook Page and Website Blog for more updates along the way! 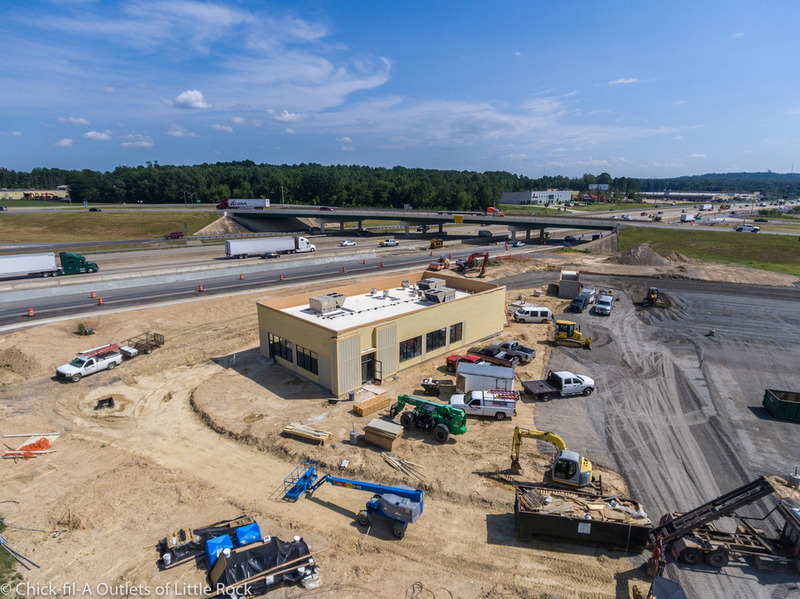 Check out another Aerial footage from our construction site location. Check back to see the continued progress of the restaurant. 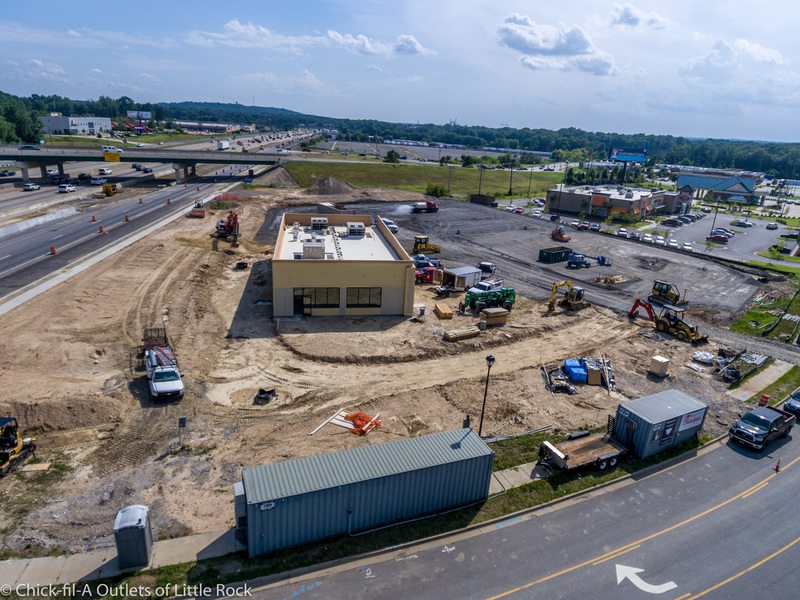 We were able to capture a sneak peak aerial view of the restaurant. As the construction continues to progress we will continue to provide footage our construction. Be sure to stay tune as we update our page. Chick-fil-A Outlets of Little Rock is excited to announce that our website is live. Follow us daily for updates.